Washington, D.C. driver Danny White thought he had a really good idea for a joke. But the joke's on him--to the tune of $20,000, reports local affiliate NBC4. White's prank started 25 years ago when he got a vanity license plate reading, "NO TAGS." He told NBC4 that he was "Just having fun!" and that "D.C. don't get the joke. They don't get it." The issue? 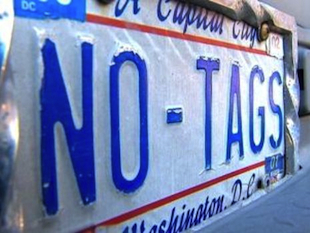 Each time a car without proper identification is cited for a violation, a DMV employee enters "NO TAGS" into their paperwork. Because White's vanity plate is registered with the District of Columbia's DMV, his name and vehicle appear in the computer's system whenever a "NO TAGS" violation is entered. Notices for the fines are then mailed to White's residence. Vanity tags have a long history of causing trouble for the DMV and other motorists; White is hardly alone in becoming a target for bad ticket karma. In 2006, the Los Angeles Times reported on California driver Nick Vautier, who got into trouble over his personalized license plate, which simply contained his initials, "NV." Unfortunately for Vautier, "NV" is also the California DMV's code for when a vehicle's plates are "Not Visible." "I started to get random parking tickets from Los Angeles, where my car has never been," Vautier told the LAT. "For every type of car. Except a Mazda. Which is what I drive." Vautier eventually gave up his vanity plate, which White refuses to do. White himself drives a Chevrolet Avalanche truck. So, when a ticket arrives at his home citing a non-Chevy vehicle, he doesn't have much trouble getting those dismissed. But White isn't always so lucky when he does get a copy of a ticket meant for someone else's Chevy. "I've got enough tickets here to plaster my whole car," he told NBC4. "It had to be $20,000 in tickets. Over $20,000." White says he has to take time off from work every few months to have the tickets dismissed. And yet he still refuses to give up the vanity plate, even though the backlog of other people's tickets prevent him from renewing his license or registration. After hearing about White's story, NBC4 launched an investigation with the Washington, D.C. DMV. And while the DMV has yet to "fix" the problem, DMV Director Lucinda Babers told the station that she's considering simply revoking White's vanity tags, along with other "confusing" plates, to avoid any future mishaps. In the meantime, Babers said ticket writers must collect the last six digits of a vehicle's VIN instead of "NO TAGS."